Raphael Miranda's weather forecast for Saturday, Aug. 11. Heavy thunderstorms prompted flash flood warnings across much of the tri-state on Saturday, and Storm Team 4 warned that spotty showers and some thunderstorms could be possible overnight. A house was struck by lightning in Edison, New Jersey, and power was knocked out for thousands of people. More than 70 flights were canceled and more were delayed at Newark Airport. The heavy rain and flooding forced Penn Station to close its Seventh Avenue entrance, according to New Jersey Transit. In Fairview, New Jersey, severe flooding displaced dozens of people, the Red Cross said. At Route 66 Nissan, in Totowa, New Jersey, meanwhile, a bystander captured video of cars floating down a flooded path away from the dealership, crashing into one another, overturning and getting stuck in some nearby foliage. The rain is expected to persist into Sunday, but the showers will be less widespread, Storm Team 4's Raphael Miranda said. A flash flood advisory was issued for south-central Morris, Hunterdon, Mercer, Somerset and Middlesex counties until 5:45 p.m. on Saturday, and a flood advisory was issued for Hudson, eastern Passaic, northern Union, Bergen and Essex counties until 5 p.m.
A flash flood warning was issued in parts of Atlantic and Cape May counties in southern New Jersey until 5 p.m. That includes Ocean City, Somers Point and Northfield. The skies darkened and thunder boomed in New York City, where a flash flood warning expired by mid-morning. That warning also included Westchester and Rockland counties in New York, southern Fairfield County in Connecticut, and Hudson County in New Jersey. Around 2.74 inches of rain fell in Central Park on Saturday — a record-breaking amount of rain, according to the National Weather Service. More than 2 inches was also recorded at the Westhampton Airport. In Upton, in Suffolk County, more than 4 inches of rain fell, according to initial reports by the National Weather Service. Video showed cars driving through a flooded FDR Drive along Manhattan's east side. Meteorologist Raphael Miranda said more rain, at times heavy, was possible throughout Saturday afternoon and evening. Additional flooding was also possible. Drivers were warned not to drive through flooded roads. The entire region is under a flash flood watch through Sunday morning. 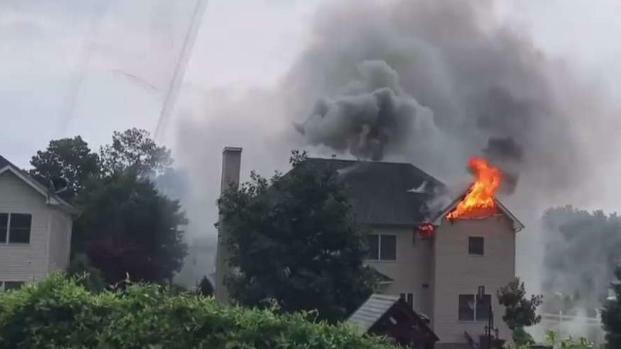 Lightning struck a house in Edison, New Jersey, setting it on fire, police said. A house in Edison was struck by lightning, setting it on fire, police said. The house on Sarah Court was hit by lightning around 7:30 a.m., police said. First responders found the roof on fire. No injuries were immediately reported. The storms knocked out power to thousands of people. PSEG in New Jersey reported more than 7,000 customers were without power, mostly in Union, Mercer and Hudson counties. JCP&L reported more than 1,000 customers without power in Somerset, Warren, Hunterdon and Sussex counties. At Newark Airport, 38 incoming flights and 35 outgoing flights were canceled, according to the flight tracking site FlightAware. Even more flights were delayed. The storms rained on Summer Streets, in which 7 miles of streets in Manhattan were closed for free activities, for the second week in a row. The route remained open but most activities were canceled.